Morey’s Piers Presents… PigDog Beach Bar! Plus more great stuff going on at Morey's Piers this summer! The Wildwoods, NJ – June 7, 2018 – Morey’s Piers is cooking up fun this summer with new restaurants, revamped menus and national food holiday celebrations. 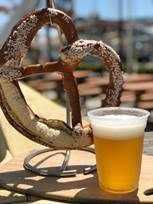 PigDog Beach Bar, the newest dining venue at Morey’s Piers, opens on Saturday, June 16. The grand opening festivities will take place from 11:00am to 10:00pm with giveaways, live music, and beachside ocean views. 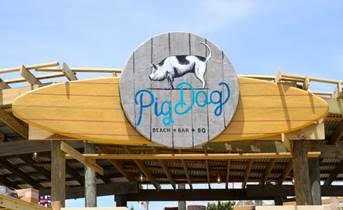 · PigDog Beach Bar: Both family and dog-friendly, this new breed of beach bar is serving up tasty barbecue classics, cocktails and local beers on tap. Special dishes include the PigDog Dog, a foot-long all-beef hot dog topped with smoked pulled pork and jalapenos on a potato roll. The Pig Big, another must-try, is a sourdough loaf stuffed with smoked pulled pork, covered in Monterey Jack cheese, and topped with pickled jalapenos and scallions. PigDog Beach Bar invites pooches and guests of all ages to kick-back and enjoy the laidback atmosphere accessible via Raging Waters Water Park, the beach, and the boardwalk. Open daily from 10:00am to 6:00pm; for more information visit: https://www.moreyspiers.com/food/pigdog. · Jersey Girl: Located a block away from Mariner’s Pier, the restaurant is under new management and has a refreshed menu while still offering guests classic Jersey Girl vibes. Featuring American cuisine with a Mediterranean flare, new dishes include: hot baked spinach and feta cheese dip; feta and summer watermelon salad; a variety of fresh fish main dishes; and turf options such as filet mignon and hot spiced “flat brick” chicken with chilled crab. Jersey Girl is open seven days a week from 5:00pm to 10:00pm; visit https://www.jerseygirldrinksanddining.com for more information. · VIP Tours: Morey’s Piers will continue weekly tours starting mid-June through August for an insider glimpse at what happens “beyond the boards.” New this year, a food-focused tour treats guests to a sampling of culinary treats while the games tour will offer a peek into boardwalk fun and games. Scheduled tours start at 11:30am and last for approximately 75 minutes. The cost is $35 per person and recommended for ages 12 and up. For the full schedule and to book, visit: http://www.moreyspiers.com/viptours. · National Food Holidays: All summer Morey’s Piers is celebrating beloved boardwalk fare with special offers on food items. First up is National Milkshake Day on June 20 when season pass holders will receive a free chocolate or vanilla milkshake. On July 23 Morey’s Piers celebrates National Hot Dog Day with free hot dogs for season pass holders and an all-day happy hour menu at the new PigDog Beach Bar. Rounding out the boardwalk-themed food holidays is National Cotton Candy Day on July 31 featuring free cotton candy for season pass holders and a BOGO offer for pier guests. · Stubborn Brothers: New menu items include a cauliflower steak sandwich, shrimp tostada, pot stickers and mochiko chicken steam buns. Steps from the beach and Ocean Oasis Waterpark & Beach Club, the outdoor restaurant has live music daily from 1:00pm to 5:00pm. Open daily from 10:00am to 6:00pm. For more information visit: https://www.moreyspiers.com/food/stubborn-brothers-beach-bar-grille. · Taco Joint: A revamped menu includes rolled quesadillas, nachos, beef, pork and chicken tacos and a churro ice cream sandwich.